Meet our 2006 Eco-Hero award winners, young environmental activists recognized for solving the world's tough environmental problems. With great pleasure Action For Nature announces its 2006 International Young Eco-Hero Awards, which recognize young people 8 to 16 years old for their environmental achievements. 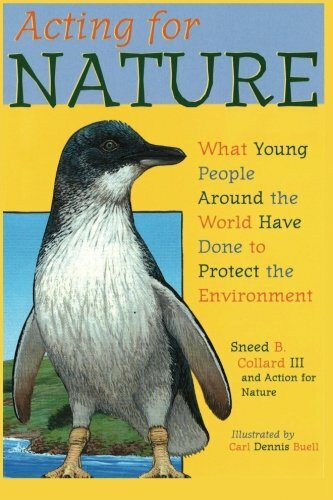 We hope the accomplishments of these outstanding young people will inspire many others to preserve and protect the Earth upon which all life depends. An avid and expert bird watcher who is able to identify 95 species of birds in Puerto Rico, Gabriela goes out every day, at different times of the day, so she can observe different species of birds. She has produced a 60-page booklet using her own photographs and identifying the different bird species with both their common and scientific names. The birds she studies are on the eastern side of the island of Puerto Rico, which has diverse ecosystems ranging from coastal regions to mangrove swamps, as well as forests and mountains. To increase her knowledge, Gabriela studied books and the Internet, and interviewed and worked with biologists. She also developed a slide show and a computerized puzzle game for elementary schools. She speaks to groups and distributes her materials through schools, libraries and community organizations. Gabriela is providing her information to a local community group which is working to place restrictions on the redevelopment of a former military base. When she goes bird watching with her family, she also does clean-ups. The Staten Island area, where James lives, faces continuing destruction of native habitat. He learned about this when he became a bird-banding helper in a local park. James noticed that after a fire, many species of birds, particularly cavity nesters, such as owls, wood ducks, kestrels and wrens, had few places to build their nests and raise their young. So after researching the specifications, James began building bird boxes for the different types of birds. Each winter he obtains permits; and with help from park officials, he installs the bird boxes. When the nesting season starts and babies are born in the spring, he inspects and observes the new birds daily by looking in the boxes, until youngsters fledge. After that he cleans out and repairs the boxes, and then sends the data he has collected to Cornell University’s Laboratory of Ornithology. This sort of work takes dedication and determination, and James’ success resulted in him being selected as an Ambassador to the Birdhouse Network, sponsored by Cornell Lab. James has given frequent presentations on cavity nesting birds to schools, park nature centers and clubs. He has also spoken at the Environmental Protection Agency Headquarters in Washington D.C., as well as at the Linnaean Society of the American Museum of Natural History. This hard work is all worthwhile to James when he holds a baby bird in his hand - he picks them up to count the eggs. When she was a second grader, Savannah learned about the beautiful place called the Arctic. The same year she also learned that the Arctic National Wildlife Refuge was in danger of being opened up to oil drilling. From an Arctic wildlife photographer she also learned that Americans waste four million gallons of gas every day driving on under-inflated tires. This is more than it was thought would be obtained from drilling in the Arctic. So Savannah went into action. Starting with her Brownie Troop, she put balloons and flyers on every car in the train station parking lot telling people how they could save gas and help save the environment. She called her new organization “Pump ‘em Up.” Since then there have been many events in several states, and her group is becoming known throughout the world. At age 7, Evan got involved with the San Francisco-based Center for Ecosystem Survival (CES), an organization dedicated to the preservation of wildlife and their ecosystems worldwide. Evan particularly wanted to help save rainforests and coral reefs. To get started, he founded a group called the Red Dragon Conservation Team (RDCT), named for the powerful mythical creature which, Evan claims, “is all about possibilities.” The RDCT, and Evan, is dedicated to inspiring friends, family members, students, teachers, businesses, and anyone else he can get to listen, to become more aware of threatened ecosystems around the world. And not just to become aware; he wants people to become active stewards for nature through the purchase and protection of rainforests and coral reefs, one of the primary goals of CES. Each year since 2003, Evan has coordinated and organized a team of students and adults from the RDCT to participate in CES’ conservation fundraiser called Bowl the Planet. Money earned from this fundraiser goes to the Center’s Adopt An Acre and Adopt A Reef programs. Evan’s team has so far raised enough money to save more than 16 acres of threatened habitat in the Guanacaste Conservation Area of Costa Rica, which contains about 300,000 species of organisms in tropical dry forest, cloud forest, and rainforest - roughly 2.4% of the world’s terrestrial biodiversity. How many cans are there in 11,000 pounds of aluminum? This is how much Tayler has collected. He rises well before dawn on many days to search the roadsides and golf courses for the cans he picks up. He has walked over 100 miles on local highways. With his dad, he has also taken apart aluminum swimming pools, decks, garage doors and streetlights and removed recyclable material from a condemned mobile home. With the sale of this aluminum, he has donated more than $7,000 to Habitat for Humanity to build a home for a low-income community member. He visited the lucky person who now lives in that home and learned that his contribution paid for the door and window frames. Tayler has placed recycling bins in five different communities, given numerous speeches, distributed flyers listing drop-off sites and been interviewed by newspapers, TV and radio reporters. He is currently talking with authorities about setting up a local drop-off center, and trying to get it funded by local industry, so that he and his parents do not have to drive long distances to deliver the recycling he has gathered. Already active in aquatic concerns and a co-founder and active leader of an environmental club, Angela learned that the water entering Lake Erie, near her home, is polluted. It is contaminated by human urban activity, and contains pesticides, garden and household chemicals, pet waste, oil, and environmental toxins. This is the number one pollution problem in Lake Erie. Additionally, the ecosystem in Lake Erie is being changed by the increasing number of invasive species introduced into it. What was once a beautiful Great Lake is now being threatened by factors that humans can control. So Angela got a group of kids together, including her brother, and founded a club to help Lake Erie called Lake Kleenerz. Through this club she has designed and published a pamphlet to educate the public, presented workshops to teachers, science classes and elementary schools, and educated more than eighty boaters about how they can prevent the spread of invasive species from surrounding streams and rivers that empty into Lake Erie. Having done a lot of research to understand this problem, called “Non Point Source Pollution,” Angela now educates homeowners and students about how they can reduce this pollution in the streams that lead into the lake. Her club was recently awarded a $1,000 grant from the Ohio Department of Natural Resources to help raise the awareness of boaters about invasive aquatic species. The Kerala area of Southern India, where Anagha lives, has heavy monsoon rains for three to four months of the year followed by severe drought. Anagha wanted to help the local farmers, many of whom have no municipal water supply, so she demonstrated to them how they could harvest and save rainwater. After reading books, websites and talking with her grandparents, she set up a system of bamboo gutters on her family’s roof to direct the rainwater into a container. Pebbles and coal filtered the water, which then entered a pipe leading to a well. Once installed, she told her neighbors about the collection system and also helped with the planting of trees, such as acacia, which increase the absorption of water into the ground. She regularly checked the rainwater collector and well. After the rain stopped, there was enough water stored for domestic and agricultural purposes. While visiting Japan for the World Children’s Summit, Chanelle noticed how clean and neat the streets were there. That inspired her to try to clean up the streets in her community of Hartford, Connecticut. She contacted the mayor, wrote letters to environmental departments, the media and all the officials she could think of, and she invited her friends and school mates to help. After getting positive responses, she set a date and asked local stores to donate gloves, trash bags, rakes and brooms. When the day arrived, about 35 people showed up to help clean up the streets. On the cleanup day, Chanelle distributed flyers with information on how to keep the environment clean, and was interviewed by TV and newspaper reporters. “I learned,” says Chanelle, “that you don’t have to grow up to become an environmentalist. You are one right now.” Afterward, other schools approached her to learn how they could do something similar. “You must start by making a plan” she told them. While doing some volunteer work at Lake Forest Open Lands, Matt got the idea of starting a group for teens. Lake Forest Open Lands maintains nature trails for walking, hiking, and cross-country skiing. The organization also owns and protects over 750 acres of prairie, savanna, wetland and woodland in Lake Forest. With the support of Open Lands, Matt founded the organization WOLVES, Working Open Lands Volunteering Environmental Students. Starting with 23 seventh and eighth graders, the group has removed non-native plants and fish from a pond and other parts of the preserve, and built Great Horned Owl nests. Their hard work is paying off, as the plants they have put in are thriving. Matt has learned to be a leader and has enhanced his love of nature and his knowledge of birds, prairies and plants. He has also learned how good it feels to do something beneficial for the ecosystem. When she was 7 years old, Dara visited a manatee exhibit in Florida. There she learned that the gentle manatee’s only natural enemy is man. She was determined to show that man can also be the manatee’s greatest champion, so she started giving talks to schools about the dangers manatees face from boaters, loss of habitat, and pollution. She joined the Save the Manatee Club in 1997 and became its youngest volunteer. She raised money to help rehabilitate injured manatees through running booths at events, raffles, and “adoptions.” In addition, she started a group called “Mission Manatee” for preschoolers, kindergartners and elementary school students. She has made presentations to hundreds of students, urging children and teachers to understand that we share, not dominate, our earth with other species, and that we must respect and protect them. From these activities she has learned “that it really is true that one person can make a difference in helping to improve our world.” Check out the Save the Manatee Club for more information about helping manatees. Kristiana founded the Environmental Action Club in her school in 2004. Since then she has been encouraging students to get involved in caring for the environment through letter writing campaigns on various environmental issues, including global warming and wetland destruction. She has also offered many energy-saving ideas. The club has organized trash pick-ups, educated the public on how to recycle Christmas trees, and has planted 600 trees in a natural resource area. Leading this group has been very positive for Kristiana, who has honed her political and leadership skills. It has given her hope that she and her peers will be able to accomplish a lot to protect the world they live in. Pierce was surprised to learn that massive amounts of reusable materials are thrown away each day. His own school spends over $23,000 each year on paper alone. To help reduce this waste, Pierce started and is expanding a large network of recycling efforts at his school. He built the organization department by department, working with teachers, students and the administration. Every Tuesday and Thursday, he stays after school and makes sure all the recycling bins are emptied, no matter how long it takes. When Victor looks around him in his town in Tanzania, East Africa, he sees all sorts of problems which trouble him, including pollution of water, air and land. He started his own garden, in which he grows grasses, flowers and trees, to demonstrate how beautiful land can be if it is cared for. He read books and pamphlets and searched the Internet to become environmentally well informed. He also joined the Children’s Health and Environment Club to share his ideas with others. He has taken part in tree planting, cleaned market places, and cleaned out invasive water hyacinth plants from Lake Victoria. He has educated, persuaded and reached out to others by speaking, teaching and creating posters, and through creating stories and games for children. Victor refers to environmental pollution as the “fever of the world.” He is sad that many people believe environmental issues to be of little concern, while he sees these issues as long term problems with long lasting effects that could lead to death, disease and disaster. He continues to work with others, especially young people, using such creative methods as songs, poems and art to encourage them to organize and to protect the environment. Victor believes that through inspiring children he can also reach adults. When Smitha visited India with her parents, she was sad to see that many children attended schools which did not have a clean water supply. When she returned to the USA, she started a kid’s chapter of ASHA, an action group that supports education, health care and other basic needs in India. She also founded AWAKE, Water Activists Karing for the Environment. She has organized two walk-a-thons which were held on Mahatma Gandhi’s birthday in Tempe, Arizona. Between 150 and 200 people participated, and over $4,000 has been raised. This money was then used to purchase a treatment system to provide clean drinking water for children living in the slums in India. Today, over three thousand kids are getting safe water from this project. In March, 2006, Smitha attended the Second Children’s World Water Forum in Mexico, sponsored by UNESCO, where she was chosen as one of 5 children out of 112 to present her project at an intergenerational panel discussion with an adult audience from all over the world. She and her group are also involved with helping protect the San Francisco Peaks, sacred to Native American tribes near her home. We had so many great entries this year that we wanted to recognize all of the good work young people are doing, so we added a new commendation award category. Sara formed a team of teenagers who spoke individually with three hundred homeowners who have creeks and v-ditches in their backyards and educated them on the importance of keeping the waterways clear. The waters flow to a delta which is an important habitat for many marshland animals. Michael formed his own nonprofit organization called PPAW (People for the Protection of Animal Welfare) as well as spear-heading his own high school club. His goal is to protect the environment and animals. As an activist, he participates in letter writing, public protests, and beach clean-ups, and has been in the news several times. Jamie Flately is interested in frogs and heard that many are deformed and so she undertook some research to study the different types of deformity, which she documented. However, like many scientists worldwide, she is puzzled about the reason for the deformities and is worried that frogs may become extinct. Kara gave talks in her school and to the 4-H club and submitted a resolution to the senate, which became law, about the need to conserve lands for the national animal of Puerto Rico, the Oqui, which is disappearing due to habitat destruction. After finding a sick and lost rooster and restoring it to good health, Leonel took it to his class to talk about caring for animals. He also took it to organizations and parades to teach others to care for and protect domestic animals. Caraline’s goal is to better inform the public of the health risks associated with the contamination of the Ohio River Valley, and other river valleys like it, that she believes are caused by factories that release dangerous chemicals into the river. She has participated in science fairs and plans to publish her research. As a survivor of the Asian Tsunami, Anessha realizes the dangers we all will face if we do not protect the environment. She talks to groups of scouts and eco tourists about how careless and irresponsible damage to the environment leads to such problems as floods, land slides, loss of species, reduction of food sources, and loss of beauty. Using a flat piece of grassland behind her school, Lauren transformed it into a beautiful garden full of a variety of flowers, structures and insects to be enjoyed by her school and community for years to come. She raised the money for the project over a three year period. Anthony created a simple biogas digester to produce and collect gas from manure to demonstrate to local landfill managers and farmers that such a gas could be used to create electricity, as well as fuel for cooking, heating homes, and much more. He believes the large scale reclamation of potentially useful fuels needs to receive much more attention. Ashton helps to capture injured wild birds of prey (raptors, such as turkey vultures and red-tailed hawks) and takes them to a vet at a conservation club. She has learned a lot about raptors, particularly owls, and has earned a key to the cages so that she can help with feeding, cleaning and caring for the birds, which are released, if possible, or retained for educational purposes. For the last 8 months, Heather has walked around her block re-sorting the trash and educating her neighbors. People give her some “funny looks,” but when they understand, they say “Thanks!"